SpaceX will attempt one of the boldest maneuvers in the history of rocketry early Tuesday morning (Jan. 6) during a supply mission to the International Space Station for NASA, and you can watch the effort live online. 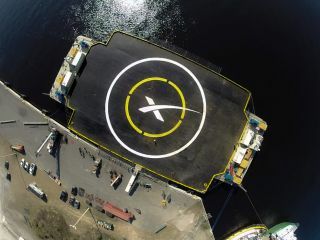 The California-based private spaceflight company will try to land the first stage of its Falcon 9 rocket on a floating platform in the Atlantic Ocean, shortly after the booster launches SpaceX's robotic Dragon cargo capsule from Cape Canaveral Air Force Station in Florida at 6:20 a.m. EST (1120 GMT) Tuesday. NASA officials have said there is a 60 percent chance of good launch weather for the planned launch. You can watch the SpaceX launch live on Space.com, courtesy of NASA TV, beginning at 5 a.m. EST (1000 GMT).